If you're looking for a local restaurant featuring regionally sourced food, great drinks and a casual atmosphere, visit Local Grille in Williamsville, NY. We invite anyone and everyone to stop by and enjoy our locally sourced foods. If you need food catered for a work event, we do that too. Our catering services are available seven days a week for breakfast, lunch and dinner. Hire us today to cater your next work event. Looking for a fun dinner restaurant? 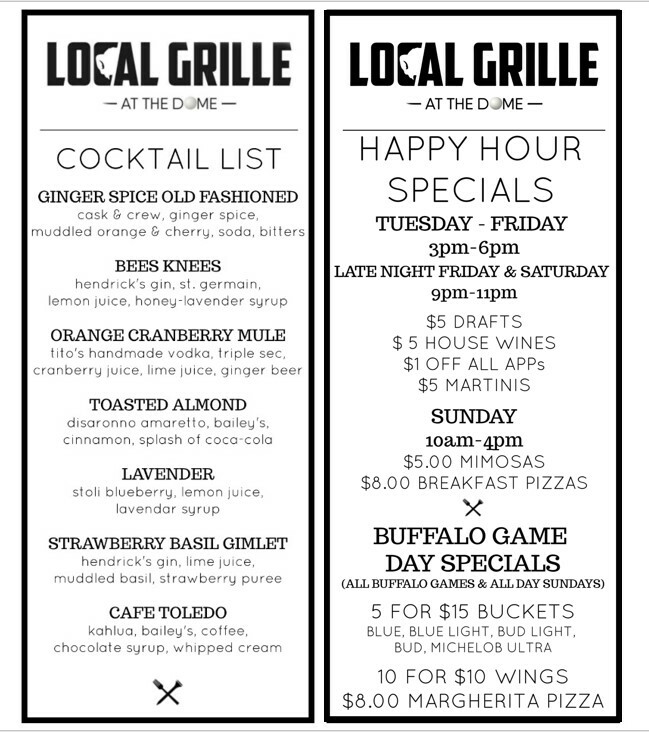 Local Grille is a year-round restaurant located at The Dome, which is an indoor golf and entertainment facility in Williamsville, NY. We offer the perfect place for golfers and non-golfers alike to try local cuisine. Our beer selection, consisting of beers crafted in breweries within 30 miles of our restaurant, is the icing on the cake. Visit our lunch and dinner restaurant to eat, drink and relax on our patio. You can also visit our sister bar, Rule 26 inside of the Dome. Call us at 716-529-3429 to order take out or 716-339-9195 schedule catering. Local Grille has a brunch, lunch and dinner menu. Whatever kind of food you're in the mood for, we supply it. Visit us during our brunch hours from 11:00 am to 3:00 pm and try our poutine Benedict, or wait until dinner time to get our lobster ravioli. Our lunch menu has a wide variety of options, as well, letting you taste everything that the Williamsville, NY area has to offer. Stop by our restaurant in Williamsville, NY to try local food and drinks. Copyright © 2019 Local Grille, all rights reserved.